So I have a confession. I drink diet sodas and I buy things in the store that are made with Splenda. I also eat Jello with Cool Whip on top of it on an almost daily basis…even though I recently found out that Cool Whip is made up of nothing but chemicals. I understand that it is not the best thing for me, but in all honestly I probably eat 85% “clean” eating…with 15% being processed foods. And I’m ok with those numbers. I do want to get better and I have started using Truvia instead of Splenda. Truvia is made from Stevia which is a plant that grows naturally…so it is a step in the right direction. I have started testing it out in baking and have found that when baked, it does not have any strong after taste. And I am so thankful for having discovered Stevia, because sometimes no matter what a girl (and a boy) need chocolate. So today I whipped up a recipe for brownies that is only 102 calories or 3 WW points! With the use of egg whites instead of regular eggs, these brownies are very cake like…they do not have that extra dense texture of a regular brownie. So while they may not be as amazing as some of the brownies I have enjoyed in the past, they are something that I can enjoy and not feel guilty about…or have to spend an hour in the gym burning off! Jorge was turned off when I told him what was in them (whole wheat flour, wheat germ, applesauce, and truvia), but once he smelled them baking and had his first bite he completely changed his tune! I think the double dose of chocolate in these really helps to make them feel much more decadent then they actually are! Recipe Note: If you choose to not use truvia, just double the sugar to 1 full cup sugar. Preheat oven to 350 degrees. Spray an 8×8 inch cake pan with Baker’s Joy. In a medium mixing bowl, using a sturdy whisk or spatula, mix the applesauce, vanilla, egg whites, sugar, and truvia together. Add the flour, wheat germ, cocoa powder, espresso powder, cinnamon, salt, and baking powder. Stir the mixture until it is just combined and no lumps remain. Pour it into the prepared pan. Bake for 12 minutes at 350 degrees. Quickly remove from oven and sprinkle with the mini chocolate chips and then return to oven and cook for 8 to 10 minutes more, or until a toothpick inserted in the center comes out dry, a few crumbs are ok. Transfer the pan to a cooling rack and allow them to cool 5 minutes. Cut into 9 equal brownies. Mmmm these look delicious!!! And dang…definitely guilt-free! These brownies hit all the right notes with me–not just low-cal, but also low-sugar AND whole wheat?? Sign me up! I frequently use apple sauce in recipes as a way to lighten them up, but have never tried it in a recipe with chocolate. Thanks for sharing! Gah, I need to make these ASAP. I’d be afraid to eat the whole pan, though. I guess that’s what the weekly flex points are for though, right? LOVE the title! And great job sneaking in the “good stuff” to a chocolatey recipe to make it more healthy. Not a fan of the Truvia because of the aftertaste, will have to see how it does baking. You should check out TruWhip! All natural ingredients, and tastes delicious. Ever since discovering it, I’ve never bought Cool Whip again! Awww, so perfect and WW friendly. I’m on the Truvia bandwagon now instead of Splenda. I’ve been slowing weaning off it for the past month, and have been itching to bake something sweet. This might be the perfect cure! Great idea! 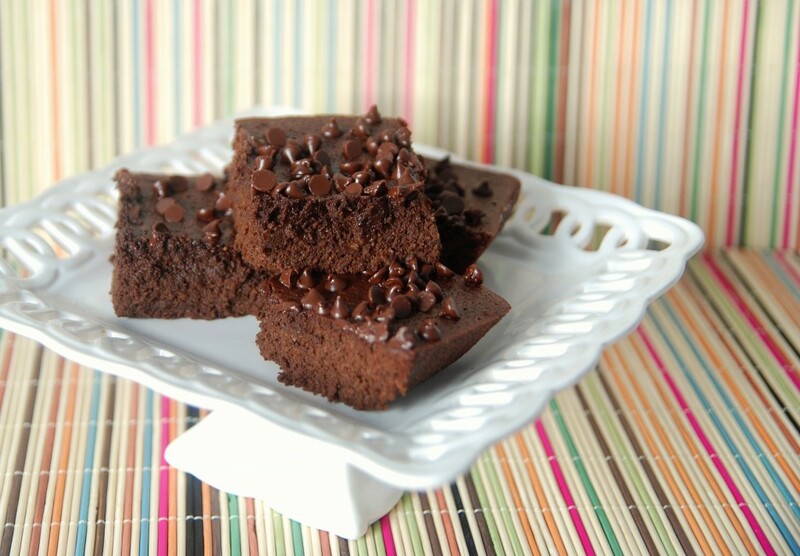 I love brownies…could seriously pass for a bfast, lunch or dinner item in my book :). Making them a little healthier gives me piece of mind! Yup! Your right there….. sometimes a girl just needs chocolate. Thanks for adding that bit about this recipe not having an after taste if using Truvia. I have used Truvia in my coffee and it tasted like black liquorice! I’m definitely going to try and make this. You sound like me! I’m still a fan of Cool Whip with Jello, although more inclined to make Jello Cook & Serve Chocolate pudding to go with my Cool Whip, much better than instant or the single serve cups. Question about the Truvia: Checked their website, they said it would take 24 packets to be equivalent in sweetness to 1 c. sugar. Is the 4 packets right or are they a different size? Would love to try this recipe. 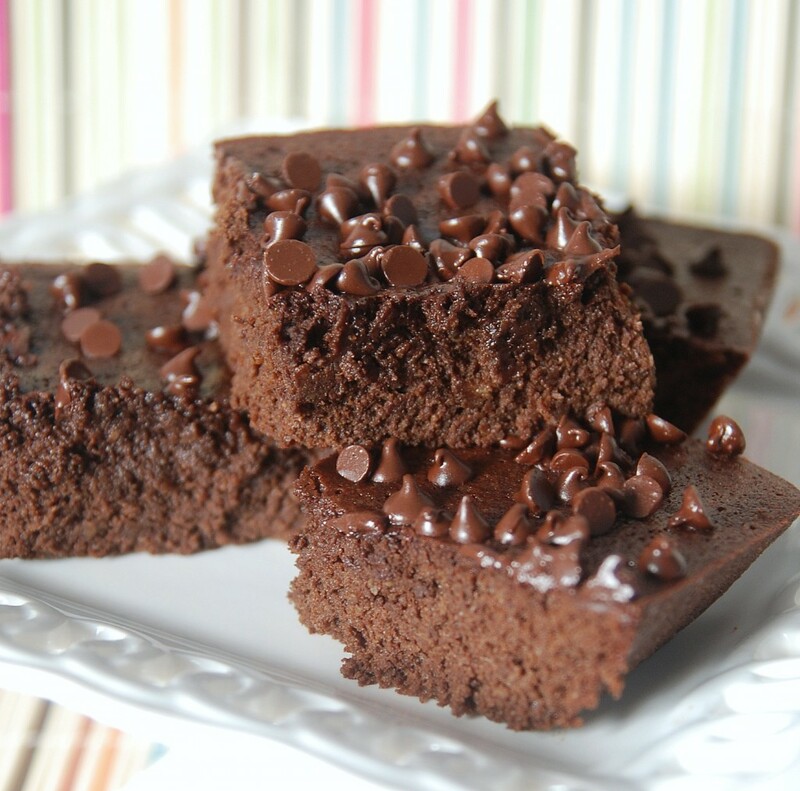 A skinny brownie that looks like THIS? Impressive, Jessica! I’ll have to give this a shot sometime. My mother and mother-in-law are always looking for alternatives to full-fat, full-sugar, so they would appreciate this recipe too. I’ll send it on to them! Please bring these tomorrow 🙂 Love you! Have you tried ground flaxseed? It’s similar to wheat germ, but it has more protein and fiber per serving. Brownies def look delish though! YUM! I am making these this weekend! Will definately be making these, they look super yummy, many thanks. Delicious, guilt-free and chocolate?! I’m in heaven! Oh that looks delicious! I didn’t know anybody else loved Jello and Cool Whip as much as me! Hey Jessica! Thank you for checking out my blog! I can tell I’m going to love yours as I’m also doing WW so I am loving your propoints (what we call them in England) friendly recipes!! First to try will have to be these brownies!! This recipe looks great. I love jello and do the same as you lol.